One of the great things about the Apple Watch is that you can use it and get a lot of value out of it without much setup or configuration. 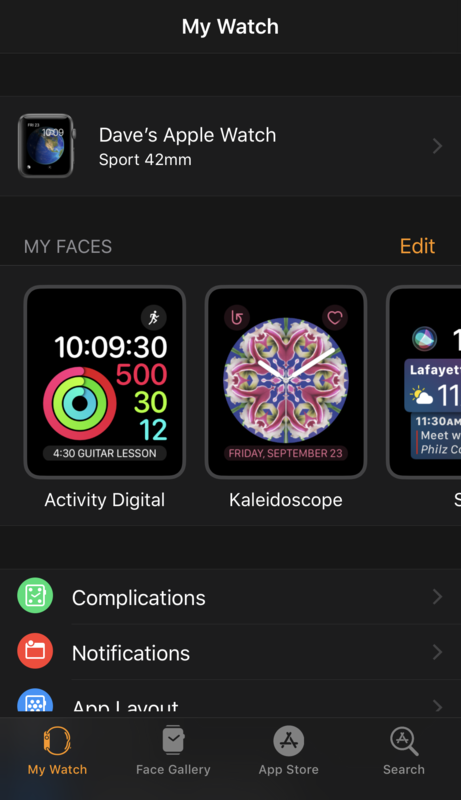 Once you want to customize things, however, you’re stuck using the Apple Watch app, one of the more confusing programs that Apple’s released in many years. Something as simple as choosing a new watch face or customizing the current watch face can end up being surprisingly confusing and complicated, so I do wonder whether there might be a complete rewrite of the watch app at some point, just as Apple has revised the iTunes user interface a couple of times in the last few years. 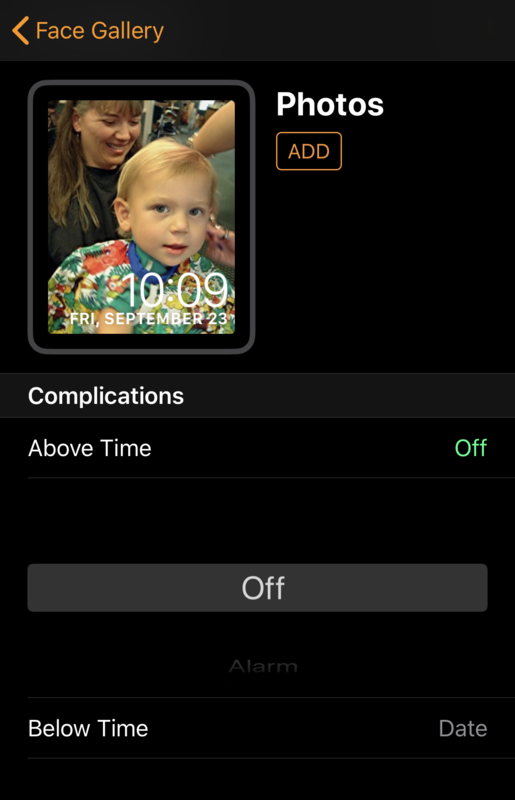 In any case, once you understand the basics of the Apple Watch app, choosing an individual photo to have as your watch face is somewhat straightforward, though to have it work with a set of photos in a photo album on your iPhone requires two separate steps in two different programs. Here’s where things can get a bit confusing. To add a watch face you don’t want to tap “Edit” adjacent to the My Faces area that’s front and center on the screen, even though that’s a logical idea. Instead, along the bottom notice there are four icons labeled “My Watch”, “Face Gallery”, “App Store” and “Search”. Tap on “Face Gallery” to find and configure a new watch face for your Apple Watch. There are a ton of watch faces here, ranging from Toy Story characters to very minimalistic “Simple” faces, so it’s easy to get sidetracked here. I understand, go ahead, take a minute or two and check out all your options. As shown above, you want to choose a “Synced Album“, then there are couple of different additional aspects of the layout you can configure too. Notice above that it lets you choose whether you want the time to be on the top or bottom, for example. Swipe down a bit lower and it turns out you can also configure – or turn off – the complications too. I’m generally a minimalist with design so I don’t like lots of complications and additional information cluttering up the watch face. But I do like to see the date at a glance since I rarely know the numerical day of the month at any given point. Easily done: I specify “Off” for the above time complication and “Date” for the below time complication. The question is: Which album is it using to sync photos? 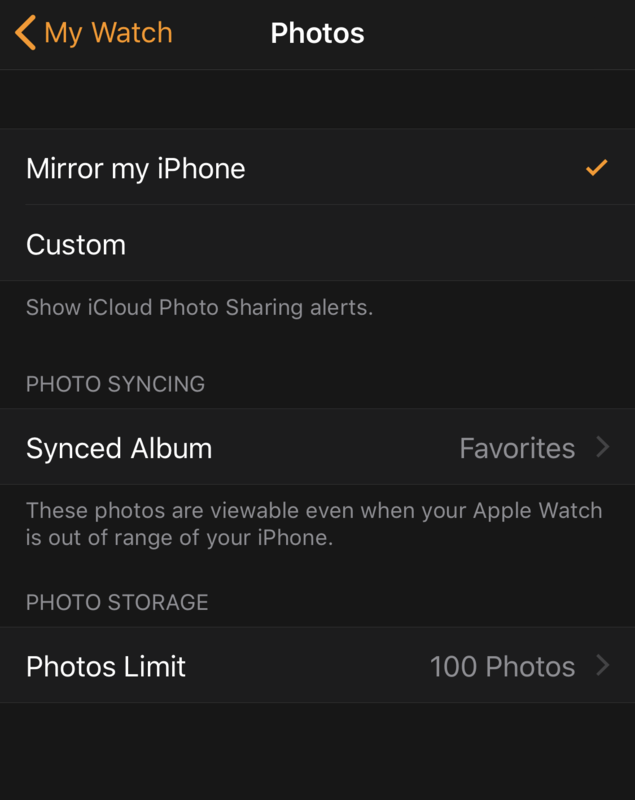 I’m syncing off an album called “Favorites” but this is where you can select a different album – even just Camera Roll if you want to see your most recent photos as postage stamps on your wrist 🙂 Notice also here that you can specify how many phtoos should be saved on the Apple Watch too: If you have space, more photos will make the raise-to-view process faster, as far as I can tell. A great picture of my Dad from many years ago. Fun, it’s a photo i never look at so it’s nice for him to pop up on my wrist once in a while. That’s it. Hope this helps you figure out the somewhat confusing world of the Apple Watch app. Pro tip: I have a lot of Apple Watch help here too, don’t forget to poke around and see what else you can learn!